The Bullpen Series from Strike Brewing Company has been all about the chance to offer guests a wider variety of beer styles at the taproom. It's also provided an outlet for Strike to develop and try out new recipes. Recent beers coming out of the Bullpen Series have included Berliner Weisse with blueberries and pomegranate, Rained Out Pale Ale with pineapple and toasted coconut, Bergamot Breakfast Pale Ale with local lemon zest and Earl Grey tea, Milk Stout and Big Wall Imperial Stout with Madagascar Vanilla Beans. With such creative beers coming out every month or so and only available at the taproom, it's not a surprise that these Bullpen beers don't last long upon their release. I was curious about how the Bullpen Series came about and was able to connect with its developer, Strike brewer Ryan Bridge, a South Bay native. My Q&A with him can be found here on my local beer site. 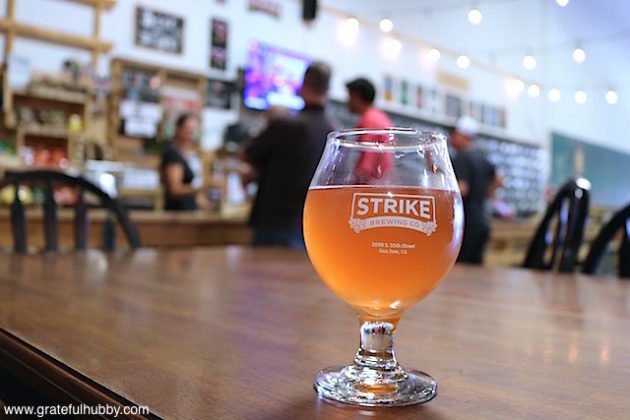 Strike is also celebrating the 2nd anniversary of their taproom opening on Oct. 8. Click here for more info. and tickets.